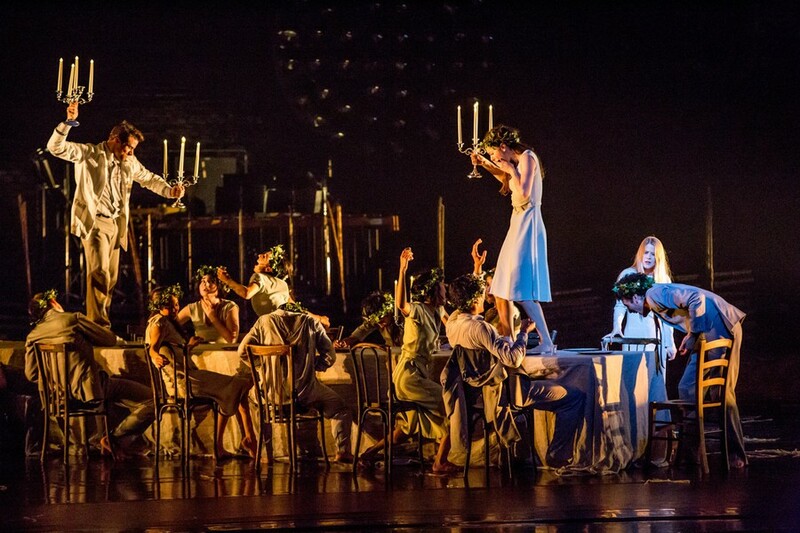 Joffrey Ballet Puts a Spin on Shakespeare With "Midsummer Night's Dream"
The ballet takes its name from Shakespeare’s popular play, but this is where its similarities with Shakespeare end. This, of course, was intentional: The company repeatedly warned in its advertising, “This is not Shakespeare’s Midsummer” and “Think Shakespeare? Think again.” These hints only make one wonder how different their Bottom (the donkey) might be from Shakespeare’s version of the character. There is no Bottom. Nor is there anyone else easily identifiable: The cast consists of nameless men and women wearing clothing in muted shades, reminiscent of characters in a dystopian film. The program labels the dancers in vague terms: the Dreamer or the Lovers. The characters are anything but ordinary—there is the Chef en Pointe, who appears early on in the first act, naked but for an apron, grilling sausages in pointe shoes, sunglasses, and a chef’s hat. The Chef en Pointe is just one of the many bizarre people on stage, and possibly the most amusing. The audience is presented with two headless, suited men, a moving ball of hay, and a couple seemingly unable to stop getting with each other. The props are similarly nonsensical. Random tuna fish keep appearing at odd moments, lowered down from the ceiling or sidling in from the sides of the stage. There is a cross made out of hay and a woman posing confusingly with a toy shark. At one point the dancers all rush together holding different props, with an urgency implying that the objects will finally make sense when placed together: When all is still, the only thing that has changed is that all the weird objects are now in one place. However, rather than alienating the audience, this bizarreness prompts a desire to understand. Moreover, Alexander Ekman’s seamless choreography and adherence to traditional ballet technique results in an exceedingly professional performance that demands to be taken seriously. The ballet centers on the Dreamer, confidently portrayed in all his hesitation by Temur Suluashvili, who welcomes the audience filtering into the auditorium as he sprawls asleep in a bed placed in front of the drawn stage curtain. Suluashvili is woken by his real-life wife, Victoria Jaiani, and the ballet begins, with the curtain opening to reveal a gleeful scene of dancers quite literally rolling in the hay, signifying the day of joyful summer activities to come. Throwing hay into the air and rolling around with cries of “Wee!,” their actions would seem completely spontaneous if not for fact that the hay is thrown at exactly the same time and the rolls are completely synchronized, creating such a fluidity of movement that the dancers appear to be one. This marks the beginning of Act One, which depicts a day of intense celebration and ends in a salacious dinner at a long table. In what is possibly the world’s most stunning depiction of a sesh, the dancers knock back shots in slow motion, dance on tables, and take their clothes off. Act Two begins the dream, or more accurately, nightmare, sequence. The Dreamer awakens once more in his bed to nightmarish lights flickering on and off, each time revealing a different horrific scene: maniacal laughter, jarring screaming, dancers twitching wildly on the floor. The scenes are reminiscent of the Blumhouse horror company’s logo of floating furniture and a bloodstained girl. Despite all this, there is comedy to be found in the Dreamer as he awkwardly tiptoes around these sights with his bed in tow, uncomfortably trying to find a way out. Similar moments of bizarre comedy permeate the piece. More than once, the dancers gather at the front of the stage and stare at the audience, as if waiting for them to speak. Throughout all of this, Swedish pop star Anna von Hausswolff wanders through scenes, half-narrating the events on stage in haunting vocals. As she hangs in a melancholy fashion over the Dreamer’s bed or weaves through jeté-ing dancers, she brings coherence to a production that might otherwise seem too disjointed.